(a) New Equipment Warranty - Company warrants to the original purchaser of Equipment that, for the Warranty Period of one year full warranty for parts and labor (excluding shipping) and limited lifetime warranty on internal parts for all devices. The Limited Life time warranty excludes labor and shipping. The warranty confirms that the equipment will be free from material defect in materials and workmanship. (b) Equipment Upgrade Warranty - Company warrants to the original purchaser of Equipment that, for the Warranty Period of six months full warranty for parts and labor (excluding shipping) and limited lifetime warranty on internal parts for all devices. The warranty confirms that the equipment will be free from material defect in materials and workmanship. (c) Equipment Repair Warranty - Company warrants to the original purchaser of Equipment that, for the Warranty Period of three months full warranty for parts and (excluding shipping) and limited lifetime warranty on internal parts for all devices. The warranty confirms that the equipment will be free from material defect in materials and workmanship. NOTE: The foregoing warranties are made subject to the proper installation, operation and maintenance of the Equipment in accordance with installation instructions and the manual supplied to the Customer. Warranty claims must be made by the Customer in writing with thirty (30) days of the Manifestation of a problem. The Company’s sole obligation under the foregoing Warranty is, at Company’s option, to repair, replace or correct any such defect that was present at time of delivery. (d) The “Warranty Period” begins on the date the equipment is delivered. (e) Any repairs under warranty must be conducted by an authorized Company service representative in the manufacturing facility in the UK where the machine was originally built. Excluded from the warranty are repairs required due to abuse, misuse, misapplication, storage damage (e.g. stored in a place and there was a flood and the machine was drenched in water – other such, negligence, or modification of the Equipment or its components. Loss of machine due to: accidents, theft, shipping, negligence, lending out the device or any other such situation are also excluded from the warranty. (f) Company does not authorize any person or party to assume or create for it any other obligation or liability in connection with Equipment except as set forth herein. THE INDEMNITY AND WARRANTIES ABOVE IS EXCLUSIVE AND IN LIEU OF ALL OTHER INDEMNITIES OR WARRANTIES, WHETHER EXPRESS OR IMPLIED, INCLUDING ANY IMPLIED WARRANTIES OF MERCHANTABILITY AND FITNESS FOR A PARTICULAR PURPOSE. (g) Warranties are NOT transferable. LIMITED LIFE TIME WARRANTY: Company warrants to the original purchaser of Equipment a limited life time warranty on all major internal parts of Equipment. This warranty does not include any labor or shipping charges necessary to repair or replace defective parts. Warranty is NOT transferable. ACCESSORIES WARRANTY: Company warrants to the original purchaser that the accessories for all devices, excluding disposable accessories such as the self adhesive pads have one month warranty. Gloves and the French Conductive mask have one month warranty provided that the instructions that come with these items are followed closely. Self Adhesive pads have no warranty. Non Customers or anyone purchasing the equipment second hand from a previous owner may be offered at company discretion an Extended Two Years Full Warranty at 20% of the full retail (un-discounted) price of the device that the company offers at the time when the warranty is purchased. RETURN POLICY: All sales of all machines and accessories are final. No returns are allowed. No refunds will be given for any machines or accessories purchased. All deposits are non refundable unless otherwise stated in an e-mail or other company document. EXCHANGE POLICY: Exchanges may be allowed at company discretion. 1. Under no circumstances are materials or information given to the customer, including manuals and marketing materials are to be reproduced, distributed or disclosed, in any form, in whole or in part without the company’s formal permission. 2. If the wrong product is ordered and we have evidence that the wrong order was ordered, the customer will have to pay for the difference between what was incorrectly ordered and what the customer really wants as well as return shipping. 3. Two way shipping is additional for any returns or exchanges as well as repairs and no such transaction will be completed until shipping charges or any other remaining charges have been paid in full. 4. Customers who have exhausted their one year new machine warranty are required to pay labor and shipping for any repairs rendered. Labor is approximately 250 British Sterling Pounds per hour. Repaired devices have another six months full warranty during which time no labor will be paid in the unlikely event that a second repair is required during the six month period after the machine was repaired and starting from the time the customer received back the repaired device from the UK. 5. All warranties are null and void in case the customer opens the device. 6. The customer pays all TAXES and CUSTOMS. 7. No life warranty applies to accessories. 9. In no event shall Company be liable for any indirect, incidental, exemplary, punitive, special or consequential damages, or damages including without limitation, for loss of profits, business, goodwill, revenue or use incurred by customer or any third party, whether in an action in contract, or tort, or otherwise even if advised of the possibility of such damages. 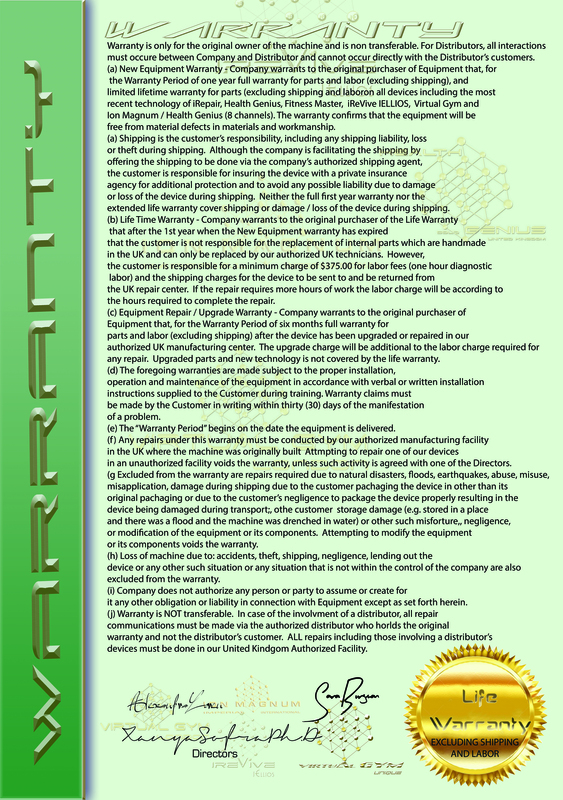 The customer further agrees to indemnify the Company and its officers, directors, employees, agents, Distributors, successors and assigns (individually, a “Company Indemnified Party” and collectively, the “Company Indemnified Parties”) and save and hold each of them harmless against any claims that any such Company Indemnified Party may suffer, sustain or become subject to, as a result of, in connection with, relating or incidental to, or by virtue of, the failure to perform or breach by the Customer or any of the representations, warranties, covenants, agreements, duties or obligations under or pursuant to this Agreement. 10. It is recommended that pads, gloves, conductive masks and neoprene belts are changed with every new client and they are regularly replaced (every 15-25 hours) to avoid possible treatment problems. Self Adhesive pads can only be used with the SAME client no more than 4 times. The company is not liable for any problems caused during treatment from pads, gloves, conductive mask and neoprene belts that have not been changed regularly, and / or that are used with more than one client or have not been properly disinfected.